Tooth bonding is the placement of composite resin on the teeth, that is sculpted and matched to the exact shade of the other teeth to correct damage or imperfections. 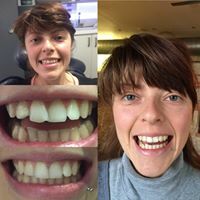 Tooth bonding is the use of a tooth coloured plastic adhesive, called composite resin that your dentist will shape and polish to match the surrounding teeth. By bonding the restorative materials onto your teeth, dentists can alter or change the appearance of individual teeth and improve your smile. Tooth bonding may be performed in a single visit and for one tooth takes anywhere from 30 minutes to an hour. It tends to be less expensive than other cosmetic treatments, is relatively painless and is usually performed without anaesthesia. Beware when biting. The resin used in dental bonding is not as strong as a tooth. If you bite your nails, or ice cubes, or the pens in your office, you risk chipping the material. If you follow a consistent oral care routine of twice-daily tooth brushing and daily flossing with a soft floss, your bonding should last for several years before it will need to be replaced.